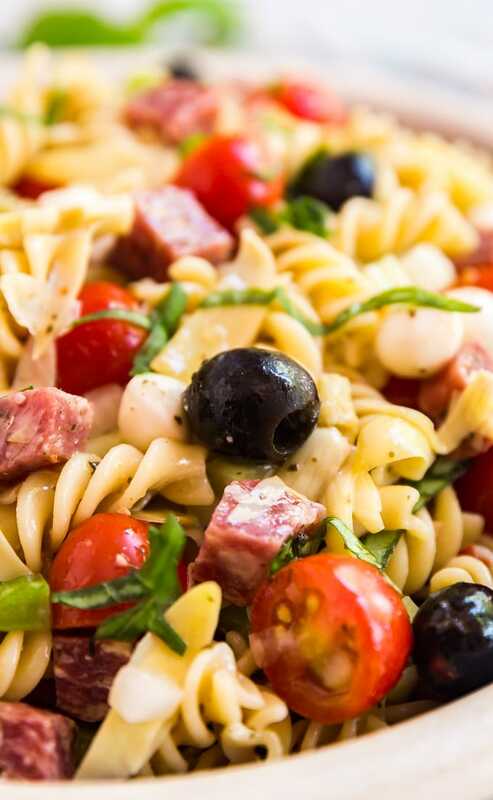 What do you get when you combine all your favorite antipasto ingredients with pasta salad? 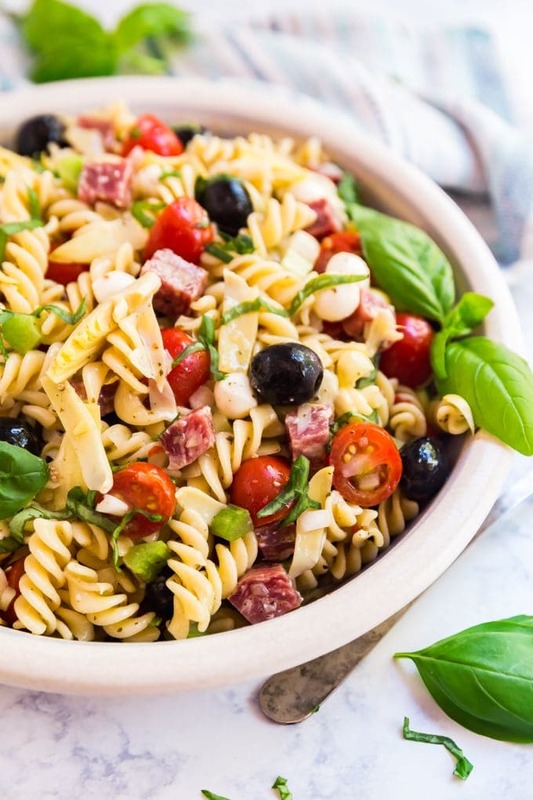 Antipasto Pasta Salad, your new go-to summer side dish. Prepare to be the most popular person at the picnic! 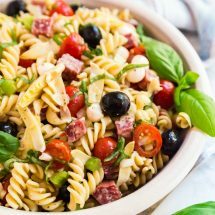 So I got to thinking: why not combine pasta salad and antipasto? These are two major players in the world of party platters and huge favorites of everyone we know. This is bound to be a hit! The great thing is, most of the usual suspects are also an excellent fit for a pasta salad recipe. And you know how pasta salads tend to get better as they sit in the fridge and absorb the dressing? Most of the ingredients here only get better as that happens (and the ones that don’t can simply be added just before serving). It’s basically begging you to make it ahead, which is totally convenient. Boil the pasta- I cannot emphasize enough; salt your pasta water. This adds so much flavor to any pasta dish and really takes the whole recipe from good to great! 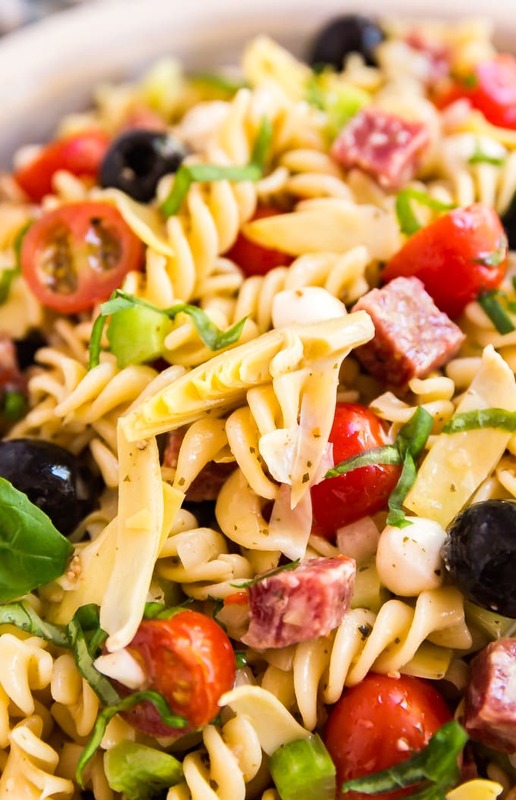 But only cook the pasta to al dente- Pasta salad only gets better as it sits and absorbs all those delicious flavors. It will soften up a bit more as it sits. Most pasta packages include a cooking time for al dente pasta to take the guesswork out of boiling it. Trust me, do not overcook your pasta. Prep the ingredients that can sit in the dressing- In general the olives, tomatoes, onions, fennel (or celery) and artichoke hearts do very well sitting in the pasta salad after it’s been dressed. 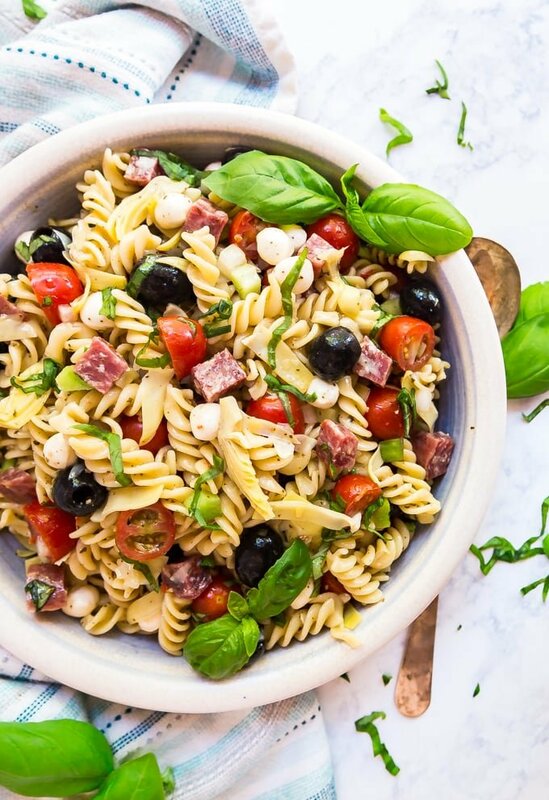 Mix the salad up and dress it- Start with half a bottle and know that you’ll probably add more dressing later because the pasta absorbed the dressing that you started with. I tend to buy an extra bottle of dressing to keep on hand in case I need more. Just before serving, add the remaining ingredients- I like to add the salami (or soppressata), fresh mozzarella, and basil just before serving. These will still taste good later but are at their very best right away. Bonus tip- chiffonade the basil- here’s a tutorial on how to do this. Don’t dispose of leftovers- There is nothing better than pasta salad leftovers! 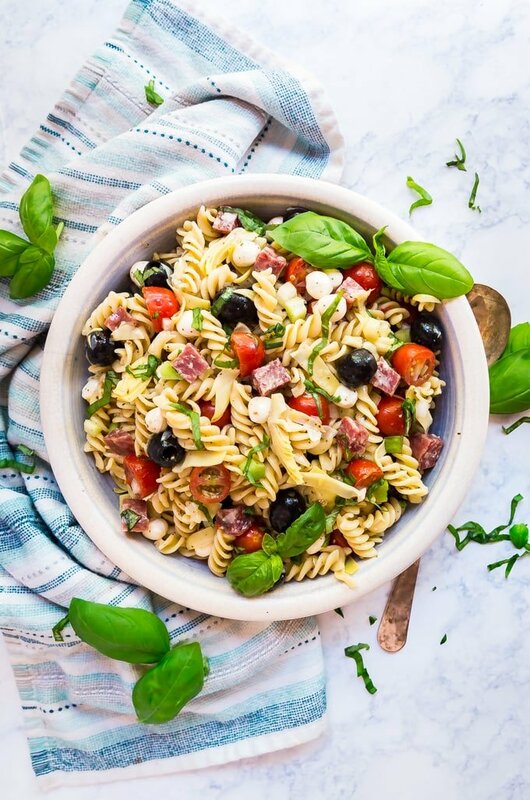 In a large bowl, add pasta, olives, artichoke hearts, grape tomatoes, chopped onion, chopped fennel and half the bottle of dressing into the bowl.